That I lack Application & Intensity of Thought to be a Lawyer, i.e. a Successful One. That I lack Discrimination, Judgment & Industry to be a Doctor. Buhler never did become an actor; he moved back to his maternal grandparents’ plantation in Mississippi, married, and ended up a law clerk after all. But Buhler indulged his theatrical inclinations in the diary he kept from 1845 to 1846. Writing about his final year at the College of New Jersey, he described events starring himself and his friends with all the detail and drama of a stage play. And to the seventeen-year-old from Natchez, Mississippi, interactions between Princeton’s African American residents and the college’s white students made the best theater of all. Portrait of John Robert Buhler, who recounted the Riot of 1846 in his diary. A friend named “Peirce”—most likely Grenville M. Peirce (or Pierce), a fellow Mississippian in the class of 1849—figured prominently in Buhler’s diary entries. One of those entries described a scene Buhler witnessed between the freshman Peirce and an African American woman. One Tuesday morning in April 1846, Peirce, his friend Lowry, and a small crowd of other students were sitting and talking outside when a young woman approached them. Buhler identified the woman (whom he called only “that Charcoal”) as Peirce’s “Ci-Devant Flame.” Whatever the exact nature of their relationship, the two certainly knew each other—a fact that became clear when the woman “spoke to Peirce by name & at the same time extended her hand to be shaken.” Lowry refused to take her hand (“of course,” Buhler noted with approval), but before Peirce could do the same the woman spoke out. Late June, 1846. “The Atmosphere begins to smell of Commencement,” John Robert Buhler wrote in his diary. Graduating seniors, “like Sickly Moustaches on a Chin of Sixteen—were struggling to bristle up into a hasty & precocious maturity,” while “pining Undergraduates” looked on enviously. Throughout the college, commencement excitement spread like a disease—and it was while this “Fever ran high” that Grenville Peirce and his friend Jerry Taylor touched off a riot in Princeton. Mary didn’t want the men’s company, especially when they began to take, as Buhler wrote, “sundry manual familiarities” on her. “Oh, leave me be—won’t you?” she cried out, drawing the attention of the African American man walking ahead of Peirce and Taylor. 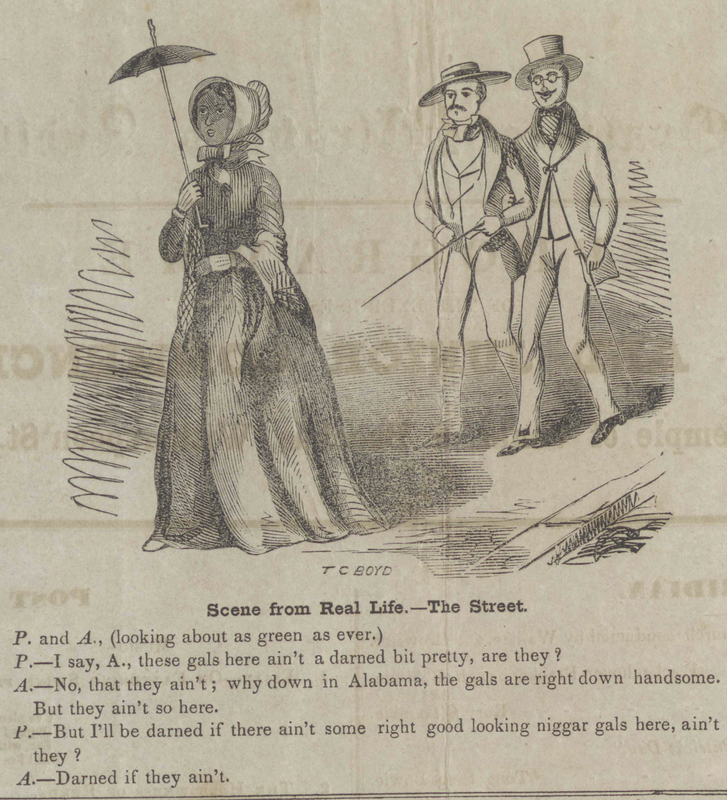 Perhaps the two men with Mary scattered—or perhaps they’d been an invention of Peirce and Taylor all along—because when the man turned around to see what was happening, he identified the college boys as the culprits. “You d—d loafers, what are you about?” he asked them. “Southern blood not being disposed to answer a Catechist of so woolly a crown as his,” Buhler wrote, Taylor responded to the man’s “insolence” with a question of his own: Who did he think he was talking to? Buhler blamed commencement fever for what happened next. Taylor was not seriously injured, but the Monday after the fight a gang of fourteen “Southern Bloods” from the college set out to capture and punish the man who’d struck him. Sketch of Princeton in 1847 by 19th century folk artist Lewis Miller. In the intervening two days someone had identified the farm where the African American man involved in the fight with Taylor worked, and the students headed there first. Buhler wrote that the man was “hired out” as a laborer—indicating that he may have been a slave, sold to the farm’s proprietor for a period of time. If the man were enslaved, he would have had to be born before 1804, when the state of New Jersey passed a gradual emancipation law applying only to enslaved people born after that year. New Jersey didn’t formally abolish slavery until 1846, but even then slaves born before 1804 were “apprenticed for life” to their masters. Slavery wouldn’t truly end in New Jersey until after the Civil War, with the passage of the Thirteenth Amendment in 1865. The owner of the farm where the man (either bound or free) worked also employed free white laborers. When the “Southern Bloods” arrived and demanded that the proprietor hand over the man they wanted, he refused—“the Refusal backed & ‘substantiated’ by a dozen brawny Irish Laborers in his service, who opposed themselves in armed phalanx to the further Progress of the Invaders.” The Irishmen had armed themselves with farm implements and were prepared to fight the college students off if they had to, but when one of them raised his hoe, a southern student pulled out a revolver. Outnumbered and outgunned, the farm’s owner agreed to give the southerners what they wanted, but only on the condition that they take the accused man to a magistrate rather than engage in any sort of extralegal ‘justice.’ The boys accepted the terms—“foolishly,” Buhler thought—and proceeded back to town, accompanied by the white laborers, who didn’t trust the students to keep their word. Buhler’s account of these two brief but violent incidents in June 1846 provides a window into the complex relationships between and among white and black Princetonians. A black man—possibly enslaved—jumped to the defense of a young black girl in town by confronting two white students, surely knowing that the consequences could be fatal. White farm hands attempted to shield their fellow laborer, despite their differences in race. Meanwhile, Princeton students (and at least one professor) physically fought each other over the fate of the accused man. When the college boys chose sides, they brought tensions over race and slavery into the open in a community where students generally preferred to “agree to disagree.” And, unknowingly, when they divided themselves in “battle array” along regional lines, the students presaged the conflict that would divide Princetonians again when the Civil War engulfed the nation fifteen years later. An article from the Princeton Whig describing the aftermath of the Riot of 1846. 1880 Federal Census, accessed 1 December 2016, www.ancestry.com; John Robert Buhler Diaries, Autograph Book, and Notebook, Mss. 1311, Louisiana and Lower Mississippi Valley Collections, LSU Libraries, Baton Rouge, La. When Buhler entered the college in 1842, students from Southern slaveholding states comprised 50.75% of the total student body. This number fluctuated over time; when Buhler graduated in 1846 Southern students made up only 39.33%, but the next year the number was again over 50%. Database of Princeton Student Origins, Princeton & Slavery Project, accessed 16 October 2017, slavery.princeton.edu/sources/database-of-princeton-student-origins. John Robert Buhler, “My Microscope,” entry dated March 11, 1846; Manuscript; Princeton University Rare Books and Special Collections Manuscripts Collection. 1880 Federal Census, accessed 1 December 2016, www.ancestry.com. Pierce, Grenville M.; 1849; Undergraduate Alumni Records, Box 103; Princeton University Archives, Department of Rare Books and Special Collections, Princeton University Library. Buhler, “My Microscope,” entry dated April 21, 1846. The following quotes and description in this section derive from Buhler’s April 21st diary entry, except where otherwise indicated. Buhler was probably referring to Martin Lowrie Hofford, a student in Peirce’s year. Hofford, Martin Lowrie; 1849; Undergraduate Alumni Records, Box 102; Princeton University Archives, Department of Rare Books and Special Collections, Princeton University Library. Buhler, “My Microscope,” entry dated June 22, 1846. Buhler, “My Microscope,” entry dated June 20, 1846. The following quotes and description in this section derive from Buhler’s June 20th diary entry, until otherwise indicated. Buhler, “My Microscope,” entry dated June 22, 1846. The following quotes and description in this section derive from Buhler’s June 22nd diary entry, until otherwise indicated. James J. Gigantino II, “‘The Whole North is Not Abolitionized’: Slavery’s Slow Death in New Jersey, 1830-1860,” Journal of the Early Republic, Vol. 34, No. 3 (Fall 2014), pp. 411-437. Federal Census 1850 and 1860, accessed 1 December 2016, www.ancestry.com. 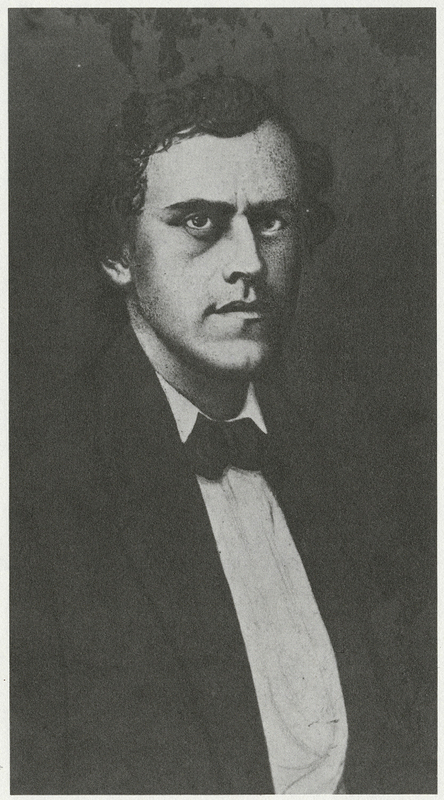 Buhler identifies the man only as “Justice Hudnut.” Several members of the Hudnut family attended the College of New Jersey throughout the 19th century, but the man Buhler describes was most likely Alexander M. Hudnut, who lived with his wife and children in Princeton at the time of the riot. Buhler, “My Microscope,” entry dated February 1, 1846. Craig Hollander and Martha A. Sandweiss, “Princeton and Slavery: Holding the Center,” Princeton & Slavery Project, accessed 16 October 2017, slavery.princeton.edu/sources/princeton-and-slavery-holding-the-center.